I have to confess that I seldom bird Orielton Lagoon these days, mainly because I have fond memories of its hey day back in the 70s and early 80s. Changes to the waterflow, brought about after serious algae blooms, altered the area drastically. Despite all that, for wader buffs in particular, it's still one of the best sites in southern Tasmania. I have a routine that I invariably follow. First stop is Cemetery Point on the eastern side of the lagoon. From there I can scan the shoreline, and on this visit a few days ago, I quickly found a group of 5 Pacific Golden Plover, roosting close to some 60 plus Red-necked Stint. I managed a distant shot of 2, "glowing" golden in the early morning sun. While watching these, a pair of Great Cormorants flew close by, and I noted the white patches on their "thighs" denoting that they were in breeding condition, and berating myself for missing a photo opp.. I needn't have worried, because another pair followed shortly after, and a few minutes later a flock of 20 or so followed them, all showing the white patch. Next stop is the northern end of the lagoon, approached via the stile on Shark Point Road, Gum boots are advisable here, at least if you intend to get to grips with the waders. I scattered a small flock of Australasian Pipits, and the odd rabbit, but little else until I reached the wet mud. A quick scan found 2 flocks of Red-necked Stint, totaling around three hundred or more, and several small groups of Red-capped Plovers. The latter seems to have had a bumper breeding year, with good numbers at several coastal sites. Closing on the waders, I picked out several Double-banded Plovers, hidden amongst the drying pancakes of mud, recently arrived, no doubt, from their breeding grounds in New Zealand. On the outer edge of the mud, I counted 21 Eastern Curlew, and although th ey were still several hundred metres away, they took flight. To the east I could see a few remaining adult Kelp Gulls, and the odd juvenile, still occupying their breeding grounds. Beyond them a solitary Little Pied Cormorant and 8 Australian Pelican, were roosting on the creek bank. The Kelp Gulls spotted me and, as usual, flew around me calling loudly. Not to be outdone, a pair of Caspian Terns briefly joined in. I wandered over towards the golf course, hoping to find more Golden Plovers, but only turned up a pair of Pied Oystercatchers (and several golf balls). My third stop was, as usual, at the outfall works at Midway Point, on the western side of the lagoon. At high tide, this spot is the favoured roost site for the Bar-tailed Godwit and Common Greenshank. The tide was only of moderate height and they were not on the favoured small spit, but walking further along the shoreline, I found them on a sand bar, around 30 Bartails and 20 Greenshank, a few of the Bartails attaining breeding plumage. With care, they can often be fairly closely approached, although I did note the fresh paw marks of an errant dog (the lagoon is a RAMSAR site). I decided to take to the water, hoping to get closer without undue disturbance, as I have many times in the past. Everything was progressing well until I realised that I was fast sinking into the silt, something I hadn't encountered before. Panic by me as I flailed around trying to extricate myself from my predicament, followed by first the greenshanks flying off, and shortly after that by the Bartails, something that I had hoped to avoid. I 'righted' myself long enough to get a parting shot of the Bartails, before returning to the task of extrication. I succeeded only after filling my gum boots with mud and water. Fortunately, the 2 species flock alighted close by, but I was not about to cause them further disturbance, and anyway, I had had enough excitement for one day. It's very nice to hear about the waders down in your part of the country. 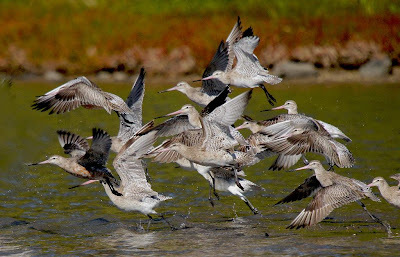 The Godwits are always so beautiful in flight. Interesting that you can apparently get close to Greenshank when they are roosting with the Godwits. Up here I find that impossible. They do frequently roost together but when Godwit just blink sleepily at me the Greenshank fly off noisily! Yes the greenshank are pretty difficult to get close to and I've yet to get any acceptable shots. Occasionally, over the years, I've found them roosting on piles and managed to get close--without camera of course! Sadly, like elsewhere I suspect, the numbers visiting are very much in decline.